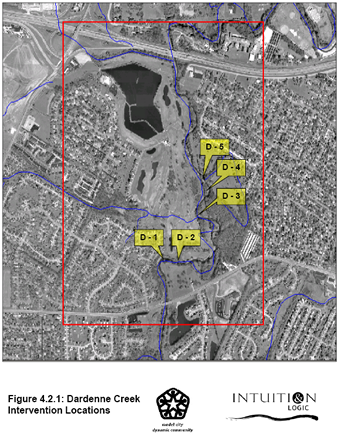 Intuition & Logic was tasked to conduct a geomorphic and hydrologic analysis of approximately 12,000 feet of stream channel in three separate watersheds to assess streambank erosion issues threatening streamside property and infrastructure in the city of St. Peters. The recommendations developed from this analysis focus on protecting threatened infrastructure and property and improving the stability of each reach without excessive interventions. 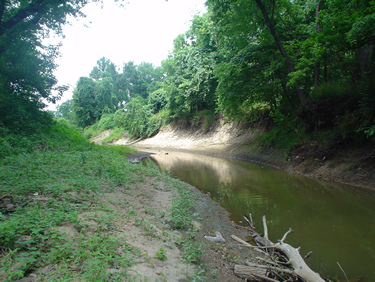 The two smaller tributaries at Margaret Brown Court and McClay Village were l incising, while the reach of Dardenne Creek was experiencing ongoing channel widening. Each process requires a different management method. 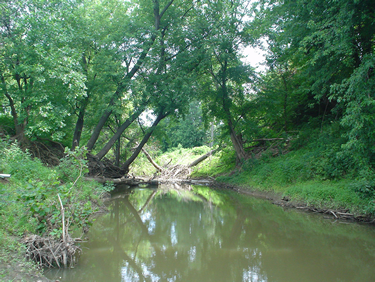 A total of 16 recommended interventions grouped into four projects were developed to address these systemic problems, as well as localized erosion concerns along each project reach. Cost opinions were developed for each of the recommended interventions which totaled $1,070,000. Project priorities were developed based on the threat to infrastructure and stream stability. The report recommends phased construction by location, priority and cost to allow for future planning and budgeting by the city.